This Granny sent her darlin' Annie out west cause she knows how to help folks in bayou country, and that's what California is turnin' into now with all that rain. 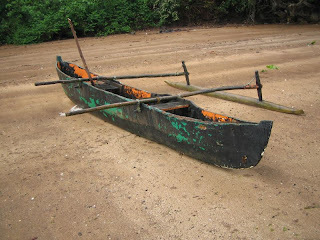 My Annie calls me and tells me this morning, "Granny, I carved out a pirogue with some fellows here, but they needed so much help, I darn near lost my mind. I had to take my rifle and put it away there was so much yellin', I didn't want anyone confusin' that with someone just gettin' drunk and tearin' up the place. The Cajuns are good on those pirogues but us Creoles, you know we are better; so if we can teach those folks from California to row that pirogue like Louisiana folks can, they might make it out of here soon. Son of a gun, she's takin' off with the pirogue!